Hello, I’m finally recovered from the whirlwind weekend that was Onstage. 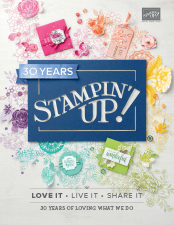 This was my second time going to a Stampin’ Up! 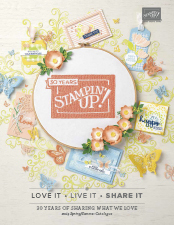 event and I loved every minute of it, especially seeing the stunning new catalogue that’s coming in June. We were very lucky to be given some of the new products to play with at the event and even better got to bring some of them home. One of the items we received was the mosaic mood dsp which is a lovely mix of Mediterranean inspired colours with both patterns and images. If you have followed my blog for a while you might have seen I’ve been following #loveitchopit so with that in mind I have made this dsp case insert to store the new paper in. I hope you enjoy! I will be back with more sneak peaks of the new catalogue tomorrow.